"It all looks a little hot to me"
There was an art gallery upstairs at the cultural centre, but Mr Monkey wasn't allowed to take any pictures. 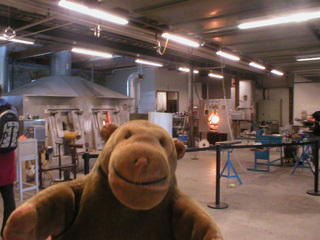 Downstairs, he found a workshop where they made different sorts of glass things. 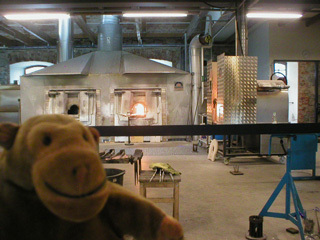 Mr Monkey was a little alarmed to find out that the furnaces burned at something like 3000°C. He made sure not to get anywhere near them. You can read about the palace and the cultural centre at the Steninge Slott Kulturcenter website.